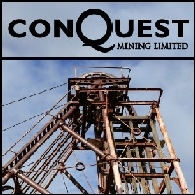 Conquest Mining Limited (ASX:CQT) (PINK:CQMLF) is pleased to advise that it has completed the acquisition of the remaining 40% of the Pajingo gold mine in Queensland through the acquisition of HSK Gold Australia Pty Limited ("HSK Gold"). 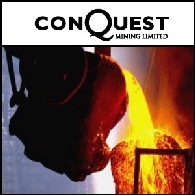 Conquest Mining Limited (ASX:CQT) (PINK:CQMLF) is pleased to announce that, as a result of acceptances it has received in respect of its takeover offer for North Queensland Metals Limited (ASX:NQM), it now has a relevant interest in more than 90% of the NQM shares. As at close of business last Friday, Conquest had a relevant interest in 90.48% of the NQM shares. 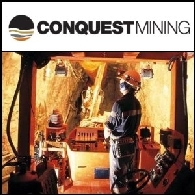 Conquest Mining Limited (ASX:CQT) (PINK:CQMLF) is pleased to announce an equity raising to raise gross proceeds of up to A$45 million. The equity raising comprises a placement to institutional investors to raise up to A$40 million for which Conquest has received binding commitments from a range of existing and new institutional investors and a share purchase plan to raise up to A$5 million. 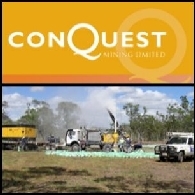 Conquest Mining Limited (ASX:CQT) (PINK:CQMLF) is pleased to announce further drilling results from the recently discovered high-grade eastern extension to the V2 deposit. 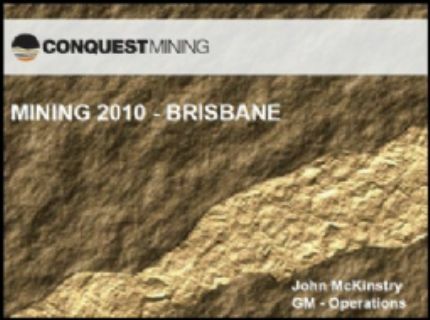 Conquest Mining Limited (ASX:CQT) (PINK:CQMLF) is pleased to announce that, based on the acceptances it has received in respect of its takeover offer for North Queensland Metals Limited (ASX:NQM) up to and including Friday 24 September 2010, it has obtained more than 50% of the NQM shares. 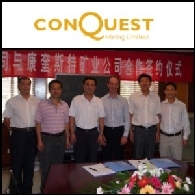 Conquest Mining Limited (ASX:CQT) (PINK:CQMLF) has entered into a long-term concentrate offtake contract with Shandong Guoda Gold Co. Limited for the sale of gold-silver-copper concentrate from Conquest&apos;s V2 deposit at the Mt Carlton project in north Queensland. 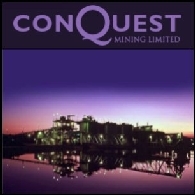 Conquest Mining Limited (ASX:CQT) (PINK:CQMLF) announces that it has received notice from Acorn Capital Limited ("Acorn") that Acorn has advised its custodians to accept Conquest&apos;s takeover offer for North Queensland Metals Limited ("NQM") for Acorn&apos;s entire shareholding in NQM totalling 22,123,821 shares (or 11.04% of all the NQM shares). 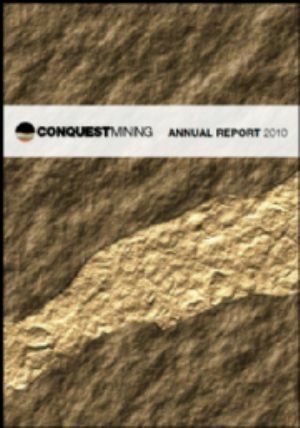 Australian Market Report of September 16, 2010 inclues; Conquest Mining (ASX:CQT) has entered into an offtake contract for the sale of gold-silver-copper concentrate from its V2 deposit at Mt Carlton, Heemskirk Consolidated Limited (ASX:HSK) has announced the signing of an agreement with Conquest Mining Limited (ASX:CQT), Imugene Limited (ASX:IMU) today announced it has successfully completed a second trial of its Porcine Reproductive and Respiratory Syndrome (PRRS) vaccine and Synthesis Energy Systems Inc. (NASDAQ:SYMX) and Coalworks Limited (ASX:CWK) today made a joint presentation titled "Production of Liquid Fuels from Oaklands Coal Utilizing U-GAS(R) and MTG Technologies".